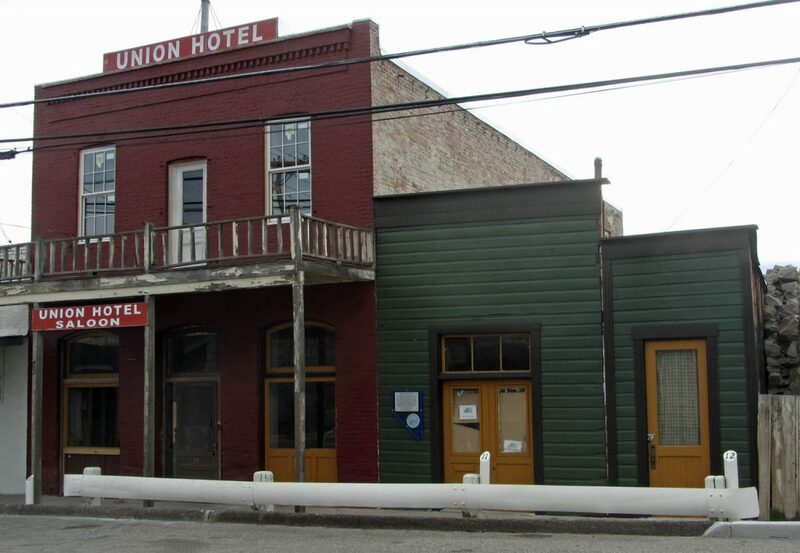 The big news is that Lyon County has just approved our Special Use Permit to occupy the hotel as a private residence. We had a lot of support from the local planner, county commissioner, fire marshal, Dayton historical society and many Dayton neighbors to whom we owe a great thank you. Getting the permit was the second largest hurdle in making this renovation possible. The largest one is still the seismic retrofits. The design is in the review process now and once that is complete, we will be looking for construction bids. It’s sad that the design process took three months because we are running out of building time this year. The retrofits require removing the roof of the hotel which may not be possible before the onset of winter. We may have to wait for spring now. Meanwhile, we’ve been working on cleaning out the interior. All the plaster on the second floor is down and we are in the process of shoveling it into a dumpster. It’s just like raking up fall leaves that weigh a ton and are full of nails. 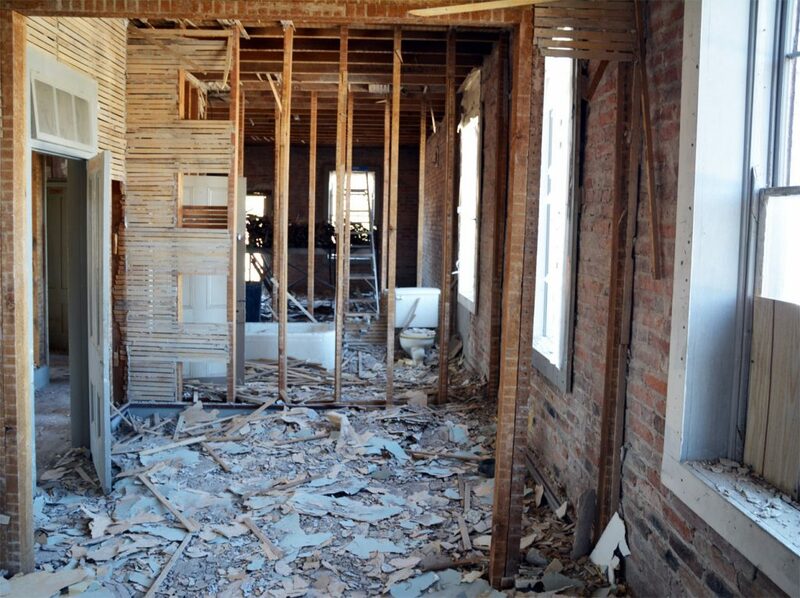 All the lath that is still usable will go to another restoration project in Virginia City and we are thrilled to see it recycled instead of ending up in the landfill. 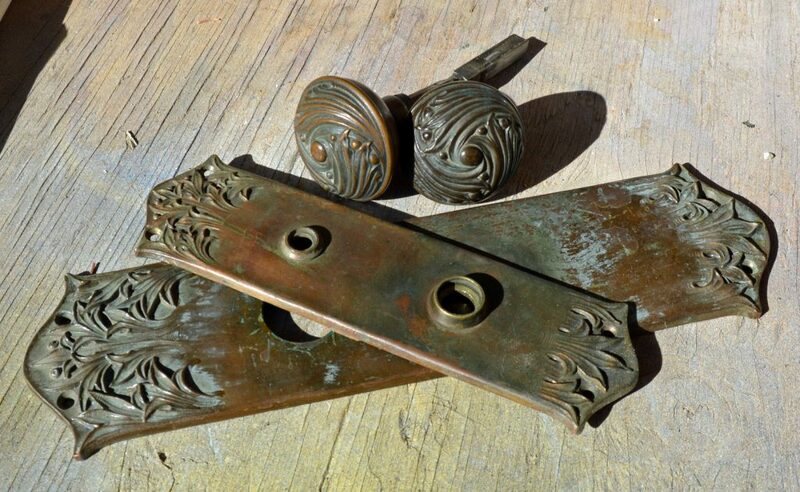 Speaking of recycling, in celebration of getting the Special Use Permit, I went shopping and found a set of knobs and escutcheons for the front door of the saloon. These are in cast bronze which I plan to gently clean so that the patina remains. The antique dealer couldn’t be sure where this set came from but it’s possible they originated in Virginia City. In any case, they’re gorgeous! Congrats on the permit to reside within! Such GREAT NEWS!!! I’m so excited you’ve taken in this huge project. Love that old building. By any chance, could you share the name of your electrician? I’d love to find someone relatively local for a couple of projects at our home by the river. Thanks! Hi Kathryn: We haven’t really got an electrician yet. What I expect is that I will do all the rough wiring and we’ll have an electrician do the final hookups. So happy to hear about the permit. I’m glad you are willing to preserve a piece of history.